You are in a weekly group meeting and you suggest an idea. Your boss says, “Rahul, that’s a good idea. Why don’t you give a presentation in the next meeting?” Perhaps you don’t do anything for the next two days, sort of enjoying the feeling that your idea was appreciated. And then on the third day, you realize you have a presentation to make. But before you open the PowerPoint and start firing the bullet points, please take a pause. Imagine your presentation is like a mono-act play and you are about to write the script for the play. What do you need to have in the first place? “The Plot”! What’s your plot, buddy? What are the ingredients in your presentation so that its taste will linger? Is it going to be more like a mind teasing Sherlock Holmes story? or more like an emotion-filled Obama speech? That is where this workshop comes into picture. In this 1-day workshop, you will learn techniques that will help you design your presentation. We will see how these techniques are used by master presenters like Steve Jobs and Seth Godin. For example, check out how Steve Jobs used curiosity flow technique for his iPod launch in 2001.You will practice those techniques with sample exercises and then apply them for presenting your ideas. Target participant is anyone (engineer, manager, sales executive, innovator) who wants to improve the impact of his/her presentation. Bullet point addicts are most welcome. 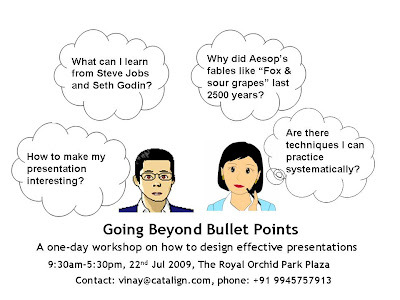 The workshop is on 22nd July at Hotel Royal Orchid. Seats are limited and early bird discounts apply.